San Juan Capistrano, Calif. -- For the 15th consecutive time in the schools' history and 12th under Coach Rossignol, the Girls Basketball team qualified for the CIF/SS Playoffs. The Lady Lion's, ranked #93 of 1393 teams in California, entered the playoffs in grand fashion conquering Fairmont Prep, ranked #6 in Orange County, by a score of 56-54. On Saturday the Lady Lions (17-11) played the #42 ranked team Chaminade (19-10) at home in an epic battle but despite all efforts came up short and were defeated 49-67. Behind a hot start from Jamie MacKay, the Lions jumped out to an early lead in the first quarter. Chaminade answered back running up a 7-point lead and the chase was on. Sophomore Jaya Shelby nailed a 3-pointer followed by a two-point field goal in the last 50 seconds of the first quarter. The surge narrowed the Eagle's lead to 4 points with a score of JSerra 12 – Chaminade 16. The Chaminade Eagles started off the second quarter with another run, but the Lions quickly responded with a run of their own. With each team holding strong on defense JSerra added 8 points (5 by junior Alex Iemsisanith) to Chaminade's 10. The slight advantage by Chaminade increased their lead by the quarter's end JSerra 20 - Chaminade 26. The Lady Lions returned from halftime on fire grabbing hold of the lead once again 27-26. Junior Sarah Shaw, freshman Jamie MacKay and freshman Ava Carter (3-pointer) all scored in the first two minutes of the 3rd quarter. Soon after though, the Chaminade offense found their rhythm once again. Scoring 19 points by the end of 3rd quarter to JSerra's 16, Chaminade began opening up a bigger lead – JSerra 36 to Chaminade 45. Despite a valiant effort by the Lady Lions in the fourth quarter, the Eagles continued to increase their advantage, and the deficit became too much to overcome. Three players for JSerra scored in double-figures during the game. Jaya Shelby led the Lions with 14 points, Alex Iemsisanith scored 12 and Jamie Mackay added 11. JSerra finished the season in third place in the Trinity League and upset No. 6 Fairmont Prep in the first round of the playoffs this past Thursday. 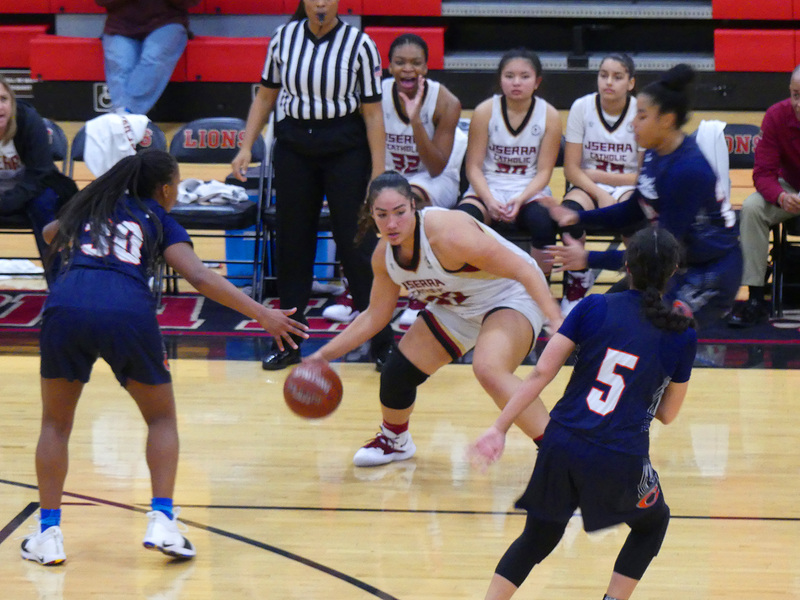 Head Coach Mary Rossignol shared, "The Lady Lions ended the season on a remarkable note -- a team comprised of all underclassmen did not lose to a team ranked outside the top 80 in California and defeated two teams in the top 40." Coach Rossignol continued, "Things look great for the Lady Lions moving forward! The season was filled with teamwork, hard work, commitment, friendships, leadership, community service, team bonding, fun memories and most of all life skills."